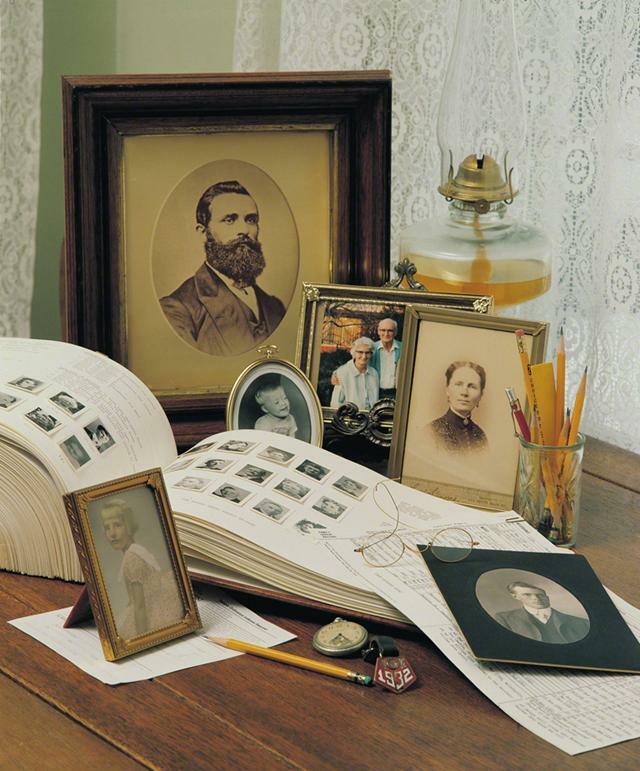 Genealogy and family history are words that I use interchangeably, but I use family history more often than genealogy. 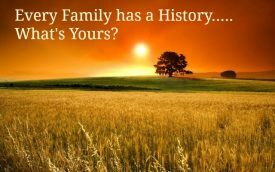 Those who differentiate between the two terms define genealogy as the names, dates and places that go on a pedigree chart and family history as the stories of our ancestors that help us know the kind of people they were. I love the stories, so maybe that is why I prefer the term family history. Get a cardboard box. Any kind of a box will do. Put it someplace where it is in the way, perhaps on the couch or on the counter in the kitchen—anywhere where it cannot go unnoticed. Then, over a period of a few weeks, collect and put into the box every record of your life, such as your birth certificate, your certificate of blessing, your certificate of baptism, your certificate of ordination, and your certificate of graduation. Collect diplomas, all of the photographs, honors, or awards, a diary if you have kept one, everything that you can find pertaining to your life; anything that is written, or registered, or recorded that testifies that you are alive and what you have done. Depending on your stage of life, you may have the certificates, photos, and letters of previous generations in addition to the documents that relate to your life. The “get a box” idea can work even if you have just gotten your own first place and your history documents are still at your parents’ house, you will just need their help in collecting the items. To read more of Christine’s articles, click here. Once you have had time to collect things, it is time to organize them. That’s where the filing system you have chosen comes in. (See Genealogy 101.) You will probably want to create a file for yourself in addition to the surname files. Within files, place items in historical order which will make it easier to record the stories these items tell. 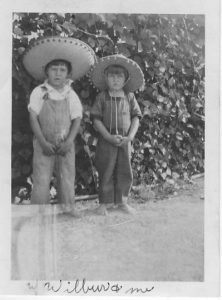 Be sure to record your own story along with the stories of your ancestors. Your descendants will be grateful you did. Are you keeping a journal? A personal journal will not only benefit those who might read it after you are gone but can help you also. We all have rough times in life. If we record those times and how we got through them, it can be a powerful aid for getting through future challenges. I will expand on writing your own history and journal keeping in future articles. There are many things that you might find to put “in the box.” I would like to share some of the things that I found that helped me know my family better. 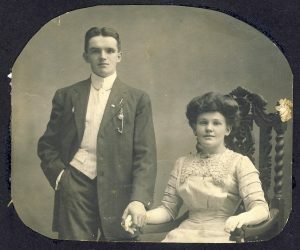 This is Cornelius and Mollie O’Neill on their wedding day. So far, I have not found a journal kept by any of my ancestors. The closest thing to a journal that I have found are twenty-four letters that passed between my paternal grandparents while they were courting. I shared how they met in a previous post. Their letters are dated between 1910 and 1914. The early letters were exchanged while they were both living in Manhattan, New York. Picture dating without cell phones! They continued to correspond after Grandpa moved to California. The letters are valuable to me because they show a side of my grandparents that I never knew. The year I was born, my paternal grandparents were both 65 years old. As a result, I only knew them as older people. Their letters show a glimpse into their lives when they were young. Their letters reveal that the wedding almost didn’t happen! When Cornelius learned that he wasn’t her only suitor, he sent an angry letter telling Mollie of his discovery and that he was headed for California to find work in the oil fields. Not only is the tone of that letter radically different from all the others he wrote, his handwriting is different too. Even without reading his words, his handwriting speaks of his anger. In a short time, Cornelius calmed down, apologized for his angry letter, and continued his courtship with Mollie by long distance mail. The following letter speaks to just how close their marriage came to not happening! Thanks very much for your kind and loving letter to hand a few days ago, unnecessary to express my delight at its receipt—First of all Mollie I am more than delighted to hear you are inclined to be mine again. And that you have gave up Jack Doran. And Mollie it was somewhat of a surprise to me to hear but I always said you would never marry him. Although I was a kind of believing it when you rote [sic] me that yous [sic] were engaged. But I am delighted to hear that it is broken off again. Hoping it’s true. 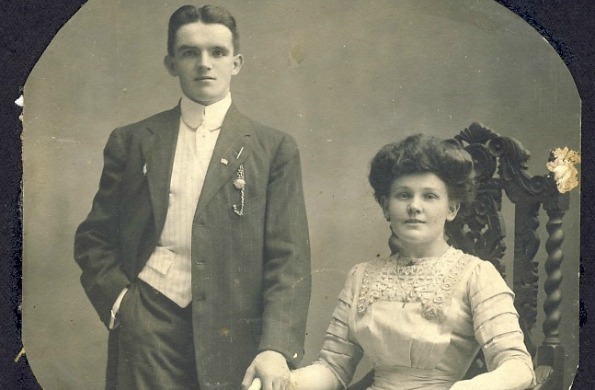 Cornelius and Mollie were married in Coalinga, California in December of 1914 and spent most of the rest of their lives in that little California desert town. Among the cards that my O’Neill grandparents saved was a Christmas card they had received in 1950 from cousins in Ireland. There wasn’t anything remarkable about the card but on the envelope flap was a return address. I consulted a map and found the address was near where my grandpa had grown up. Since the card was over a half a century old, I thought the family might have been at the same address at the beginning of the twentieth century. Consulting the Irish census of 1901 proved my hunch was right. Here was Grandpa’s cousin as a child enumerated with his parents and siblings! That census provided information about a whole family group that I didn’t know anything about up to that time. I love photographs! They give faces to the names you find in the records. The following is one of my favorites because it provides a window to the personalities of the subjects! This photo taken about 1925 is Cornelius and Mollie O’Neill with their first car. It was a surprise for me to see a woman who I had only known as stately and reserved, posed on the hood of a car! My uncle told me the following story regarding the car. When Cornelius was one of a few workers that did not become ill during the flu epidemic, he was promoted to a job that came with a company car. When Cornelius protested that he did not know how to drive, his boss replied that he had better learn fast or he was going to be doing a lot of walking! Therefore, Cornelius learned to drive. With a driver’s license, their own car was a natural next step. My greatest frustration while looking through old photographs is how many of them are unlabeled. I know well how it happens since I have many photos that my husband and I have taken that are waiting to be labeled. If you have unlabeled photos, get a soft leaded pencil and write on the back of the photo who is in it and when it was taken. While it may seem silly because you know the people in the photos so well, that’s exactly why you should be the one to label them. And as you go through your photographs, you will probably remember stories you want to write down. A trick I have learned in working with unidentified photos is to use the few that are identified as a clue to identity the ones that aren’t. I will use the following photos as examples. While I don’t usually make a habit of talking to photos, when I found these, I said out loud, “Well, “Me,” I really wish you had identified yourself a little bit more.” A few photos later, I found this next one. The caption, written in the same handwriting, reads, “Wilbur + Me.” Wilbur is my mother’s older brother which told me that “Me” is my mom! 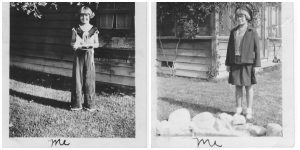 Once I recognized “Me” as my mom, I recognized, from other photos, that the building behind her in the first two photos is her grandparents’ house. Next week, I will share what I have found to be successful for talking to other family members about they know about your family. So, start making a list of people you could talk to about your family. Start with your oldest relatives while they are still living and mentally alert. Be sure to put siblings and cousins on the list. It is valuable to talk with those that are close to your age because they may have photos, records and memories that you don’t. This post was originally published in 2014. Changes have been made to make formatting consistent with site.